Glady's wrote, "This is a picture of my precious little Addie and Charlotte's grandson Austin. 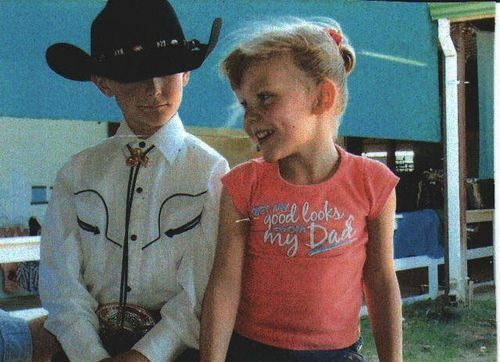 This picture was taken at one of the horse shows that Austin was in. We call this "Young Love". Austin is 9 years old and Addie is almost 6 years old . You know Charlotte and I were friends at the age of 5 yrs and went all through school together. Our lives have come and gone, but our friendship was forever. We both are hoping that our grandkids will continue to be friends for a lifetime also." See more photos of Champion Austin in Charlotte Vann Casselberry Dew's bio page - linked in the bio sectoin of the right sidebar.